The name “Jimmie Johnson” invokes many images. A seven-time Monster Energy NASCAR Cup Series champion. A certain first-ballot Hall-of-Famer. A fitness fanatic. A man with a beard so perfectly and meticulously groomed that you wonder if he’s of this planet. Well, you can add “Budding Merchandise Magnate” to that list. As it turns out, Jimmie’s spontaneous reply to yet another keyboard schmo on Twitter telling him to retire has inspired what is sure to be the fashion must-have of the fall. … which wound up inspiring a good shirt by Twitter user and race fan @LandonShaffner. Fans are awesome! @landonshaffner this shirt is on point! … which has led to this moment. YOU TOO can rock this stylish shirt. It is now available for purchase here. Order, and be awesome. Join the legions of fans who support Jimmie and are out to spread the message that, as evidenced by the final turn at the Roval this year, Jimmie Johnson shows no signs of slowing down. I had a chance to speak with Mr. Seven-Time himself regarding this magnificent attire. He was forthright and honest with his answers, as he is known to be. This is NOT made up dialogue. These are Jimmie’s actual words. NASCARCASM: “I’m far from done, JA” is a powerful message. One that resonates with both young and old. One suitable for anyone facing adversity whether in life or via a random troll on Twitter. Tell me how you came up with this motto. JIMMIE JOHNSON: I saw the posts, and I’ve seen posts from people not being so kind and suggesting my work ethic, my focus, my talents, my desire, all that stuff, is out the window and that I should just hang it up. And I saw it one too many times and saw that post and responded with that caption. NASCARCASM: Did you have any other potential responses composed other than “I’m far from done, JA” that you opted not to use? I would assume your Twitter drafts folder is quite the treasure trove. JIMMIE JOHNSON: I try to keep it clean, and I did flinch a little. I had “jacka—” written out and then I shortened it to JA. I know there’s kids watching and reading and stuff, but I’ve seen enough abbreviations that I felt like it was safe to use it and it wasn’t ultimately vulgar so I felt like it would be just fine. NASCARCASM: How did the idea for the shirt come about? JIMMIE JOHNSON: Just looking around on Twitter and I think you either posted it or responded to somebody that was making a shirt and going to Martinsville with it, so when I saw the shirt I thought it was a super-cool idea. I had a chance to actually meet the guy in Martinsville and had some shirts made for my crew guys and a few buddies that I’ve distributed, and just having a little fun with it. Hopefully we’re in Victory Lane soon and can bust out the shirts and show everybody then. NASCARCASM: Will these be available in children’s sizes? Not trying to put ideas in your head but if you post a picture of your kids in this shirt it’s gonna get ALL the likes. NASCARCASM: In what other instances in life do you think the message on the shirt is applicable? It certainly applies to more than just racing. For example, just last week at Don Pablo’s the waiter tried to take my plate as I was scraping that last remnants of guacamole off my plate with a tortilla chip and I yelled “I’M FAR FROM DONE, JACKASS” at him. What would be some others? JIMMIE JOHNSON: Anybody trying to steal your guacamole too soon is certainly appropriate. Or if they touch my ice cream. Both of those are worth fighting over. 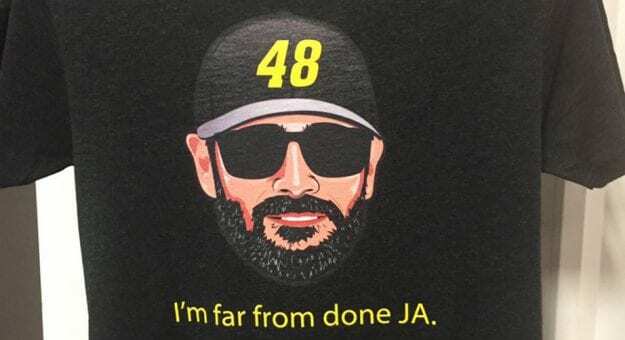 NASCARCASM: If Chad Knaus had a shirt similar to this one, with a short motto and an image of his likeness, what would it say? JIMMIE JOHNSON: This one 郎. I think he would be a little less PC and more direct. NASCARCASM: Have you had any other memorable tweets in recent years that you think also warrant a T-shirt? JIMMIE JOHNSON: I think witty ones. Look, I’ve got thick skin and I make mistakes and if I spin out their driver I’m fine having the banter. I’ve never blocked anyone on any of my channels. I read it all, I see it all – the good, bad and the ugly. But the witty ones, even if it’s something not in my favor that’s witty, just be creative. You don’t have to be a jerk. Just be creative and have some fun. JIMMIE JOHNSON: I’ve sent him a shirt, I just need to send one now in the correct language. NASCARCASM: Also, this is unrelated, but I told a couple people I would be interviewing Jimmie Johnson. More than one said “Please ask him how he keeps his beard so meticulously groomed to such a perfect length.” Can you enlighten us or is this a trade secret. JIMMIE JOHNSON: Head to your nearest pharmacy, and buy a beard trimmer. Buy a No. 1 blade and use it every third or fourth day.